Greetings, my fellow semifinalists, and welcome to the Week 15 Quarterback Rankings! Yes, it’s a big week for all of us who are fortunate enough to still be playing. I wish I could say that these rankings would lead to total clarity, but the the truth is that it’s a tough week for ranking the quarterbacks. Vegas doesn’t see a lot of offense this week and I tend to agree. Even the two highest scoring teams on the 16-game slate are not in great spots. The Chiefs go tonight and have an implied total of 28.5, but they face a tough defense and are still figuring out life without Kareem Hunt. They’ll also be missing Spencer Ware, who we’ll chat about in the RB Rankings, and Sammy Watkins. The Saints will be on the road and outdoors—two negative factors for Drew Brees and they are the second highest team in terms of implied point totals. Big Ben looks really good on paper this week, but he hasn’t even practiced yet due to injured ribs. This presents enhanced knock-out risk, but he’s still one of the best plays this week. Vegas has seven teams under 20 points this week and no teams over 30. So don’t get worried sick about your mediocre quarterback matchup. Very few people have strong ones this week and nobody has a lights out start. They simply do not exist this week from a projection standpoint. So take a good cold sober look at your matchup and play the quarterback option that suits you best. I have ‘em ranked for you, but there is not much separation between the guys in the 10-12 range and the guys in the low teens. Jameis Winston is at 19 overall and he’s a solid option. I will update all of the Rotobahn rankings before the start of Saturday’s games. I will be going over every scrap of relevant information between now and Saturday afternoon, so make sure you check out the update. I’ll be back later this afternoon with the receivers, running back and tight ends. 1 Ben Roethlisberger PIT 6.600 NE@PIT 12/16/2018 04:25PM ET He’s not practicing due to a rib injury. He’s on the good side of questionable for Week 15. ***UPDATE*** He’s now good to go. Start him with confidence. 2 Jared Goff LAR 6.400 PHI@LAR 12/16/2018 08:20PM ET Needs some home cooking after last week’s debacle. The Eagles may be ready to collapse and their DBs are of the league-worst variety. Cooks could go nuts here. 3 Drew Brees NO 6.500 NO@CAR 12/17/2018 08:15PM ET Road matchups are always tough for Brees and outdoor games are suboptimal as well. 4 Andrew Luck IND 6.400 DAL@IND 12/16/2018 01:00PM ET Tough matchup but they are at home on the fast track so Hilton is a dangerous weapon. Of course, Hilton is banged up and not a lock to play. 5 Cam Newton CAR 5.900 NO@CAR 12/17/2018 08:15PM ET Some concern with the shoulder but if he can run a little and distribute the football, he can post excellent stats. After watching last week’s game, there is no doubt that Cam is nursing a sore shoulder. He did not have his usual zip. Not even close. 6 Deshaun Watson HOU 6.300 HOU@NYJ 12/15/2018 04:30PM ET The Jets cannot take away his primary option and they give up yards to rushing QBs. Watson should be just fine in this spot. They can run the ball as well, and the Jets are not much offensively so don’t count on big pass volume here. 7 Russell Wilson SEA 6.700 SEA@SF 12/16/2018 04:05PM ET He tanked last week but this is a better matchup. 8 Aaron Rodgers GB 5.700 GB@CHI 12/16/2018 01:00PM ET He’s always a viable play but this is a tough matchup. They don't have a player to shut down Davante Adams. AR should spread the ball around and hit the big plays with Adams and perhaps, MVS. Jimmy Graham is in play too. 9 Tom Brady NE 5.900 NE@PIT 12/16/2018 04:25PM ET He’s playable for sure. The danger is the Steelers’ pass rush, but the Pats know how to get the ball out, so I expect Brady to function well in this game. I like Gronk and Edelman as stacking options if you opt to roll with Brady in DFS. How Brady handles the blitz will be huge this week. 10 Mitchell Trubisky CHI 6.000 GB@CHI 12/16/2018 01:00PM ET He’s tested now, and this is a solid matchup. He’s safe to play. 11 Matt Ryan ATL 6.100 ARI@ATL 12/16/2018 01:00PM ET Tough matchup with Peterson going against Julio. This can go either way. Julio in single can make big plays but Peterson has the talent to shut him down. Ryan is at his best when keep all of his guys involved and he’ll need to do that in this game. He’s playable for sure, but you may be able to do better. 12 Dak Prescott DAL 5.500 DAL@IND 12/16/2018 01:00PM ET Prescott is a lot like the other guys in this big middle tier. He gives you plenty of ceiling but counting on more big plays coming on busted coverage is a dangerous game. The huge game may be off the table in this spot. 13 Baker Mayfield CLE 6.000 CLE@DEN 12/15/2018 08:20PM ET For all of Baker’s big plays last week, he had a mediocre fantasy day, but this is a very different matchup. The Broncos secondary is more friendly than Carolina’s and they will absolutely give up the big play. IF Cleveland gets away from their conservative play calling, Baker could have a big day here. 14 Kirk Cousins MIN 6.200 MIA@MIN 12/16/2018 01:00PM ET His OC just got canned and they would seem intent on running more than they have so far. This is also a matchup that screams run. Cousins is a solid play but a huge game will require serious efficiency based on the vibes coming from Mike Zimmer. 15 Lamar Jackson BAL 5.900 TB@BAL 12/16/2018 01:00PM ET Love the matchup, so use him if you need him. 16 Josh Allen BUF 5.800 DET@BUF 12/16/2018 01:00PM ET He’s a very similar play to Lamar Jackson right now in that he’s winning with his legs, but Allen brings an added downfield element that gives him a monster ceiling. He’s a worthwhile consideration in tournaments and a volatile dart throw in seasonal leagues. 17 Jameis Winston TB 5.600 TB@BAL 12/16/2018 01:00PM ET Tough matchup but the volume should be there and it’ll make him viable. Not a QB1 this week though. 18 Case Keenum DEN 4.900 CLE@DEN 12/15/2018 08:20PM ET Has weaponry concerns, obviously. The Browns are without Denzel Ward again, so that helps a lot. 19 Marcus Mariota TEN 5.100 TEN@NYG 12/16/2018 01:00PM ET The Giants are not a tough matchup but is Mariota really healthy? It’s hard to say. 20 Derek Carr OAK 5.400 OAK@CIN 12/16/2018 01:00PM ET He’ll be functional here. 21 Nick Mullens SF 4.800 SEA@SF 12/16/2018 04:05PM ET Tougher matchup this week. Seattle doesn’t break down on the back end the way Denver does. 22 Jeff Driskel CIN 5.100 OAK@CIN 12/16/2018 01:00PM ET Winnable matchup, but his team is undermanned without AJG. There’s worse out there at QB this week, but be careful here. 23 Eli Manning NYG 5.200 TEN@NYG 12/16/2018 01:00PM ET OBJ still uncertain and this is a tough matchup. 24 Ryan Tannehill MIA 4.900 MIA@MIN 12/16/2018 01:00PM ET He’s a sub-optimal start to put it mildly. 25 Nick Foles PHI 4.500 PHI@LAR 12/16/2018 08:20PM ET Awful spot for them to play Foles—against such a disruptive front. 26 Matthew Stafford DET 5.000 DET@BUF 12/16/2018 01:00PM ET Has some back issues he’s dealing with, but you hopefully aren’t playing him for other reasons, like a lack of weapons not to mention pass attempts. 27 Sam Darnold NYJ 4.400 HOU@NYJ 12/15/2018 04:30PM ET The Jets offense is troubled. Not enough healthy weapons and the scheme is all over the place. Avoid Darnold like poison this week. 28 Cody Kessler JAX 4.700 WAS@JAX 12/16/2018 01:00PM ET Tough matchup and he’s barely viable in a great one. 29 Josh Rosen ARI 4.700 ARI@ATL 12/16/2018 01:00PM ET Not enough weapons to take seriously right now. 30 Josh Johnson WAS 4.300 WAS@JAX 12/16/2018 01:00PM ET So many reasons to not play him. 31 Carson Wentz PHI 5.600 PHI@LAR 12/16/2018 08:20PM ET Back spasms have derailed his status and he’s looking very likely to sit Week 15 and perhaps the rest of the season. ***UPDATE*** He’s doubtful and effectively out. No way you should wait for him. 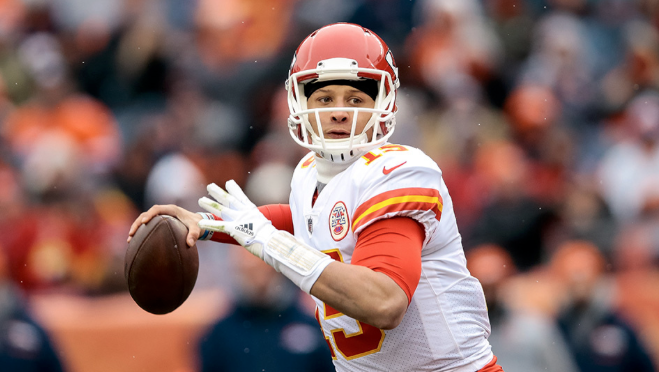 32 Patrick Mahomes KC 6.900 LAC@KC 12/13/2018 08:20PM ET Excelled in a tough matchup last week and should be able to post quality numbers in this game. 33 Philip Rivers LAC 6.300 LAC@KC 12/13/2018 08:20PM ET He may need to throw here—with so few healthy RBs to rely on and with a super sonic offense on the other side of the field. Rivers has struggled at KC, so that’s a factor as well, but they are not good at all versus the pass, so I’d be ok trusting Rivers here.